Creating content is a challenge for marketers, especially since nobody can agree on the right content length. In the next 12 months, says the Content Marketing Institute (CMI), 51% of B2B marketers plan to increase content marketing spend, and producing content consistently remains a challenge for 57% of them. Another CMI report shows that half of B2C marketers will spend more money on content this year, and 46% of them find content production an enduring challenge. One part of that challenge is working out how much content to publish how often. It’s an enduring issue, present in many previous versions of those same reports. One way to answer the question is to look at what some major content publishers do. Luckily, Moz, Hubspot and CoSchedule have done some research into publishing frequency in relation to their audiences. Moz’s benchmark publishing schedule was five posts per week. The company experimented with doubling publishing frequency to 10 posts a week for a couple of weeks, then halving it to 3 posts a week for another couple of weeks. The results? While the publisher experienced a decline in traffic and subscriptions, content engagement and social sharing actually increased. Hubspot ran a similar experiment. With a benchmark of 23 posts per week, it tried publishing 11.5 posts a week and also 34.5 posts a week. The high volume post traffic stayed steady, and attracted more leads, but also got more unsubscribes. Hubspot decided to stay at the benchmark level but change the mix of posts. CoSchedule had a much lower publishing frequency of only three articles per week. The publisher reduced this to two posts a week, and found that publishing fewer, better quality posts paid dividends in terms of attention. Hubspot found that content over 2,500 words long got more traffic and shares. One thing that all the above studies have in common is the conclusion that it’s not just a matter of publishing a set amount of content. While the data shows that 60% of marketers produce at least one piece of content daily, how that content meets your audience’s needs and your own quality standards are equally important. However, it’s noteworthy that the top media publishers in March 2016, who represent a mix of traditional and digital native publishers (everyone from Buzzfeed to National Geographic), all publish content multiple times per day. So what’s the final answer to the question of the right amount of content? This Quora response gets it right by suggesting that there’s no “right amount”; only what’s right for your audience. 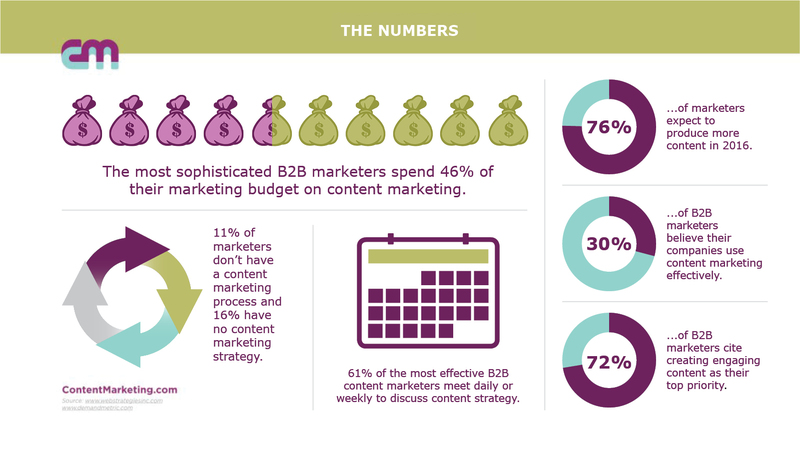 The most sophisticated B2B marketers spend 46% of their marketing budget on content marketing. 11% of marketers don’t have a content marketing process and 16% have no content marketing strategy. 76% of marketers expect to produce more content in 2016. Sharon Hurley Hall is a professional writer with more than 25 years of experience as a journalist, academic writer and blogger. Sharon's coverage includes technology, new web tools and social media, consumer finance, social media and marketing. Sharon has written three ebooks, including Getting Started in Blogging.